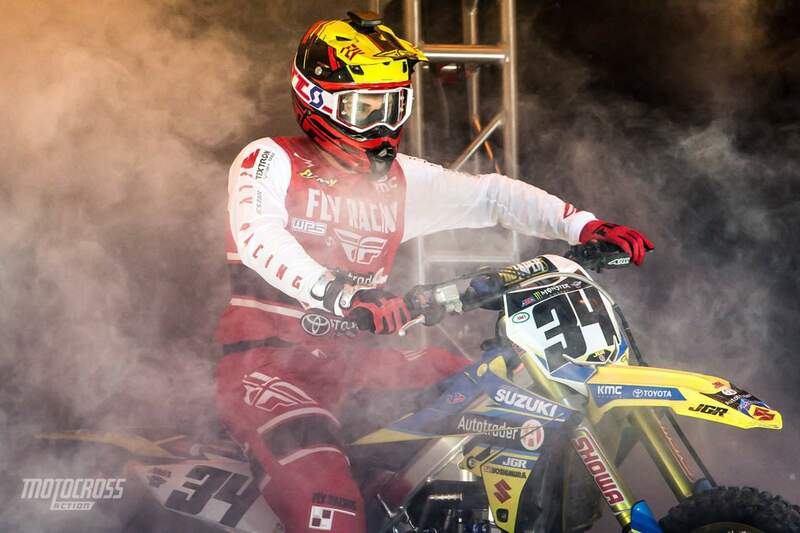 While racing in France, Weston Peick crashed hard and suffered ten fractures to his face. 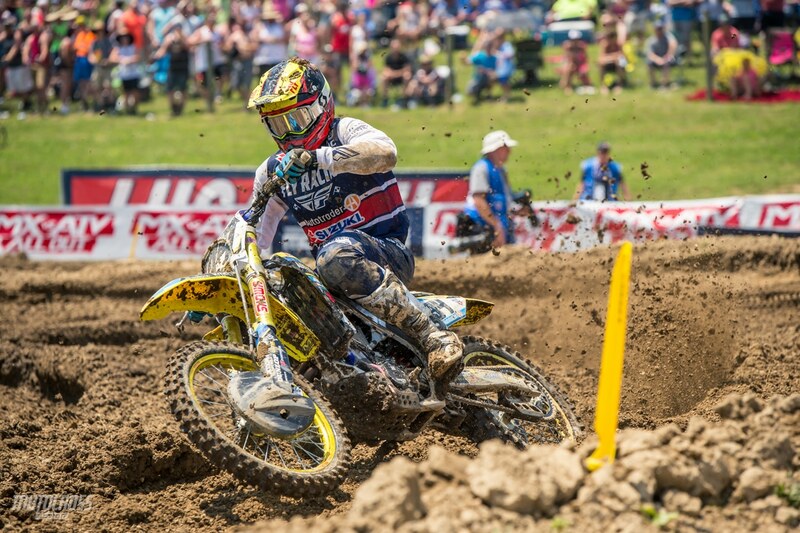 To many of us Weston Peick is the Chuck Norris of motocross – unbreakable! 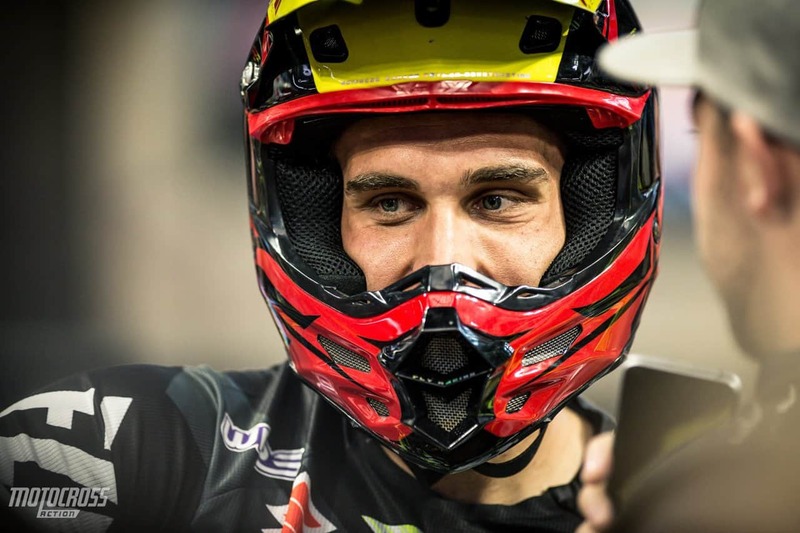 So, to learn of his horiffic injuries suffered on November 17that the Paris Supercross was disheartning. It was there that the JGR Yoshimura Suzuki rider crashed and had another competitor land on his face. Weston suffered ten fractures to his face, and doctors had to rebuild his jaw and eye sockets. Now two months later, we talked to Weston about how his recovering process is going. WESTON, HOW HAVE THINGS BEEN GOING SINCE WE SAW YOU AT ANAHEIM 1? I have progressed a lot, and I would say for the most part that my jaw and everything is starting to heal better. I am starting to get more movement from my jaw, and I can open it a little more since then. I have also gotten the hardware out of my mouth completely. Now there is nothing left so I can start doing rehab, and all of that kind of stuff. With my vision however, there has not been much more progress with that since I first got a little bit of vision back. So, I am going through the motions with that, and doing everything I can to get it to come back more. AT A1, YOU COULD HARDLY OPEN YOUR MOUTH. Yes, so that has definitely improved a lot. Just getting the wires out that were in my teeth and then getting out the inner retainer that was limiting me from being able to talk well. Since being able to get that all out, it has opened a lot more things that I can do. 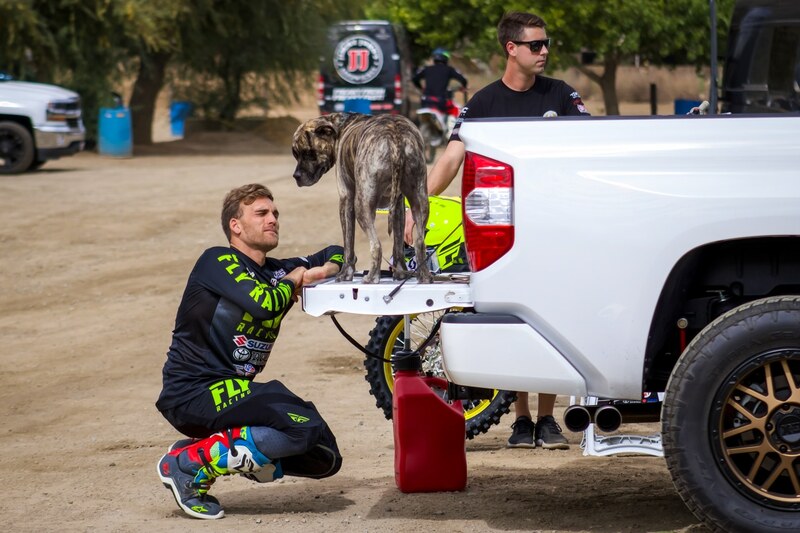 We caught up with Weston and his dog at Milestone last year shortly before his injury. YOU SEEM TO BE HEALTHY, EXCEPT FOR YOUR HEAD AND FACE. CAN YOU TOUCH ON THAT? The whole accident was mainly from my neck up. There were no bones broken or anything that was done from my neck down. I had a pretty big gash on my left thigh. Nothing was broken though, I just hit a couple of nerves and tore some muscles, but nothing was wrong with the function of it. Initially I just had a little numbness and tingling in parts of my leg, but like I said, other than that, it was one of those injuries where you are walking, and everything is fine. But I just had so much damage in my entire face, because I was facing up when I was landed on. It completely shattered my face and fractured so many bones in my face. I also broke my jaw, and so many other things. It was such a weird injury to have. I am walking fine, but I still can’t function right because of the swelling going on in my face, as well as the impact of my right eye. I lost complete vision and I’m just trying to get used to an everyday life with one eye, until my right eye can make a full recovery. It is extremely hard. EXPAND ON YOUR EYESITE. Sure, so my left eye is the good eye. But even during the first month, my left eye was really cloudy. I did not have a lot of depth perception, and I did not have a lot of close-up perspective of what was going on. If I had to grab something off the table or try to make a movement, that depth was really far off, because I was not used to having one eye open and trying to do something. So that took a long time for me to get used to, but once I started being able to move a little more and do a little exercise, I think that started the transition of having the body start to coordinate a lot better with one eye. That was a turning point, I am starting to do some exercises, and getting some normal day activity in as well. 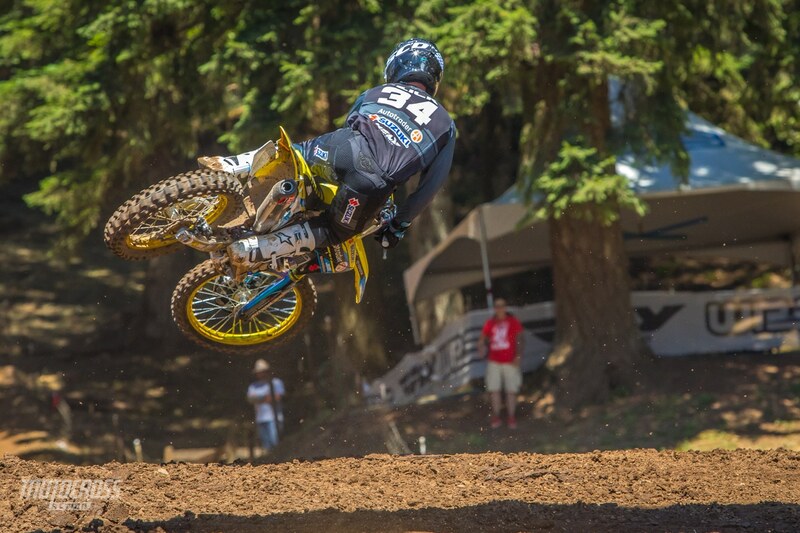 Weston getting sideways at Washougal. We hope to see him back to full health soon. WHAT ABOUT YOUR OTHER EYE? The optic nerve is what we believe is damaged and what is causing the vision loss. Because of the hard impact, something had to give, and it was my right optic nerve. There wasn’t any damage done from the images that we have gotten, but the only thing we can turn to is that it got stretched under the load of being landed on. That is where it sits right now. There is no visual damage. They believe it got stretched and some fibers tore. It is one of those things where only time is going to heal it. ARE THERE ANY MEDICAL PROCEDURES THEY CAN DO IMPROVE IT? No, unfortunately not at this time. You would think that there would be something that all of a sudden can make it better, but for the optic nerve there is nothing they can do medically. Still there are a lot of other things that I am doing to increase the possibilities of it coming back faster. I could do medical steroid shots in the eye to help with swelling, and I could do some other things as well. A good diet and taking natural supplements also can help with all types of swelling and nerve stuff. There are a lot of things I can try, but there is no doctor that would say “hey come in and this will work.” It is all just trial and error and still just trying things that might work and might not work. 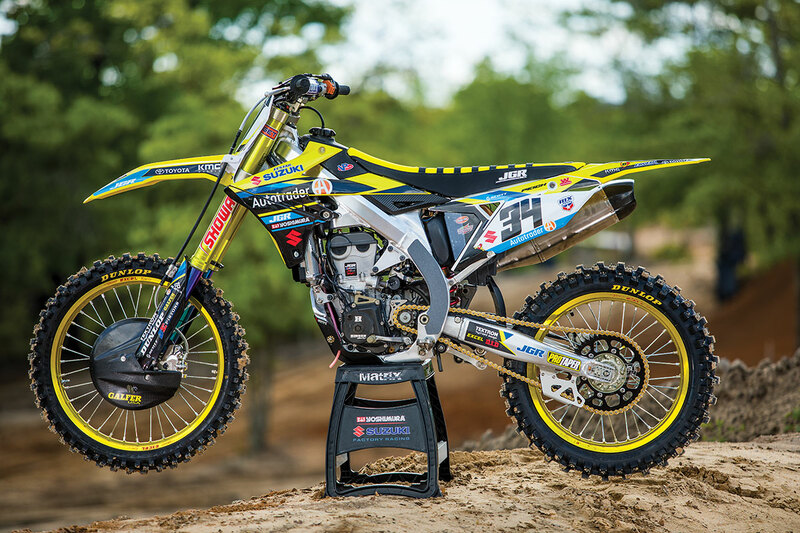 Weston’s factory JGR Yoshimura Suzuki that we tested in North Carolina last year. HOW MUCH IMPROVEMENT HAVE YOU SEEN? I definitely have seen some small improvements with just the peripheral vision that is slowly starting to come back. It is not a lot of improvement, but it is just a lot of small improvement. I definitely think that time will tell, and it should eventually start coming back a little bit more. I am staying optimistic about it and I think it will come back. Weston’s career best finish is 3rd. 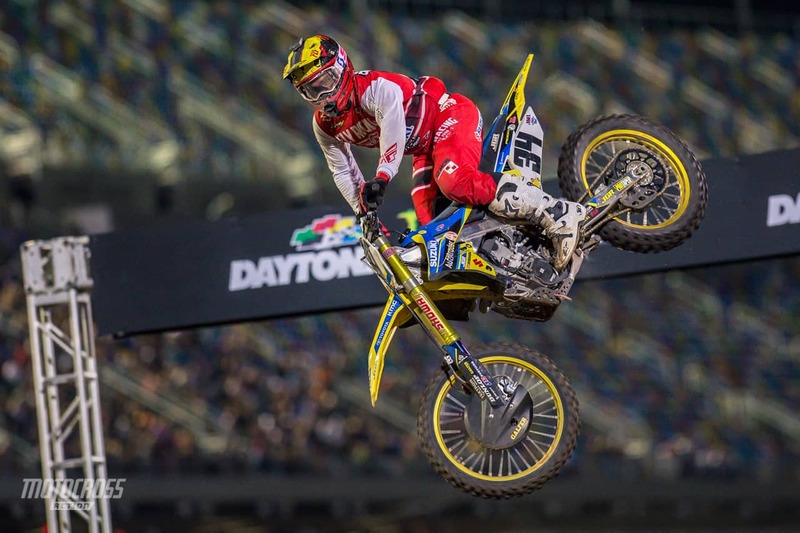 Both in 2015 at Santa Clara and Las Vegas Supercross. SINCE THE LAST TIME WE TALKED A MONTH AGO, YOU ARE DOING MUCH BETTER. With every week that goes by I am starting to feel better, I am starting to feel more comfortable getting around, and seeing better. I can start focusing on seeing better out of the one eye that I do have the best vision out of. And like I said, every week there is progress. ARE YOU ABLE TO TRAIN? Yes, actually, I have been doing some light spinning at my house. Last week I started doing some other weight training, not very heavy, but I have been trying to do some stuff where I can stay active, and not feel like a potato sitting on the couch all day long doing nothing. So, slowly I’ve started getting back into some of the stuff that I used to do before I got injured. Weston is known for having a unique style, he’s fun to watch. ONE LAST QUESTION ABOUT YOUR INJURIES, IS YOUR VISION PROBLEM THE MOST SERIOUS? Yes, that is pretty much it. I asked the doctor if my vision came back fully if it would be safe to ride again, considering all the breaks and fractures that I have had in my face. He explained that it is just like any other bone in your body. It is going to heal and be just like it was before. So, now I know that if my vision comes back fully and I’m able to race, that my face will be strong and I won’t have to worry about re-injuring my face. So, that possibility is something that we eliminated. A lot of things have improved for sure. It is a slow process, but as weeks go on , it will improve. AT ANAHEIM 1 YOU GOT TO TALK TO THE FANS ON THE BIG SCREEN. HOW WAS THAT? It caught me off guard. I was not planning on doing anything like that at this point in time, but it was an opportunity to let everybody know what was going on. I have a lot of fans in California, and letting everybody know the updates was good. I think a lot of people respected it. 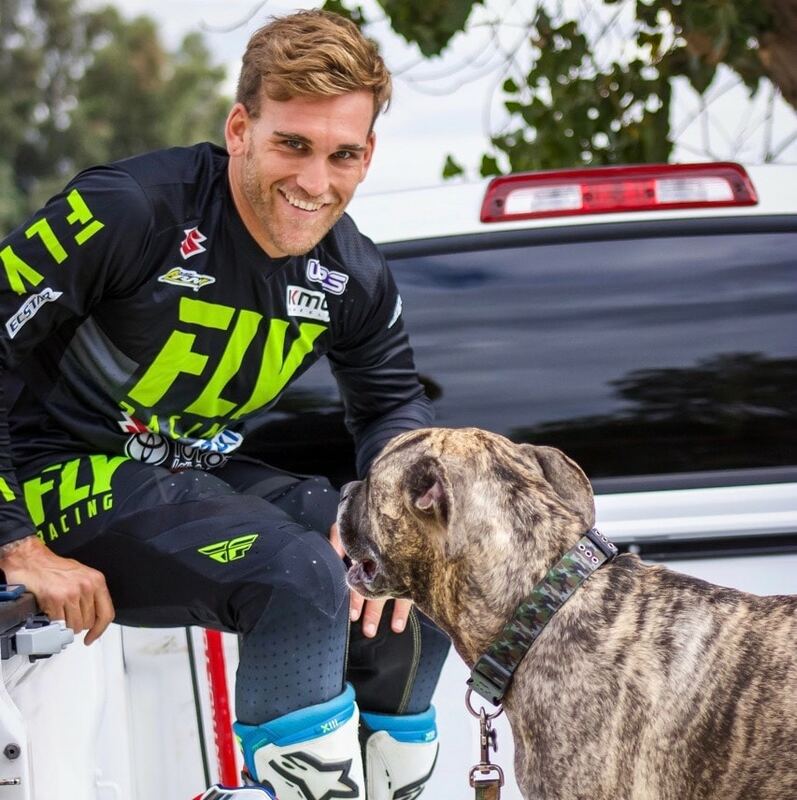 Many of the guys Weston races against have shown their respect to him via social media after his accident and they all labeled him as one of the toughest guys in the sport. YOU CERTAINLY HAVE A LOT OF FAN SUPPORT. THAT HAS TO BE COOL. It definitely is. There are a lot of fans out there and a lot of people that have been following me and representing for a long time. It is awesome to have that kind of support when you are injured, and you are not out there racing. It is good to have that in this industry. ARE YOU ABLE TO DRIVE A CAR? 3 ½ weeks ago, I could not drive. I tried, but I could not see well enough to drive. Then one day, it clicked and started driving. It took me a while to get comfortable driving with one eye. I need to be a little more cautious now, and always looking to my right more than I used to. Driving is one those little things that you take for granted until you cannot do it. Weston stretching out his shoulder on his truck while his dog hangs out. HAS ANYTHING GOOD COME OUT OF ALL OF THIS? I don’t know honestly. It is a tough question because obviously with the injury, there is nothing good about it at all. But if you want to take something out of good of it, I would say the amount of respect and love that people have given brings you closer in a certain kind of way. Other than that, it is hard to say a lot of good comes from an injury. In 2018 Weston finished 8th overall in the outdoor series. WILL THE FANS GET TO SEE YOU BACK AT THE RACES THIS YEAR? I think about it all the time. If my eyesight came back fully within a few months, racing outdoors is something I would consider. I wake up every day thinking about racing. You do what you do for so long and injured or not, you still have that mentality to do something. If something made a big progression with my eye, then it is definitely a possibility I’d come back this year and race outdoors. Everyone at MXA wishes Weston all the best in his recovery process. WHAT IS IS LIKE TO BE BACK AT THE RACES EVEN THOUGH YOU ARE NOT RACING? I like being at the races regardless if I am racing or not, but I would not call it fun. I want to show my face, show respect to the sport and show them that I am a team player. I try to do as much as I can when I am at the races, by signings autographs and greeting people. I try to help out the riders by watching them ride and trying to advise them as much as I can. I try to help out Enzo Lopes and Jimmy DeCotis, but I don’t want to overstep their boundaries. 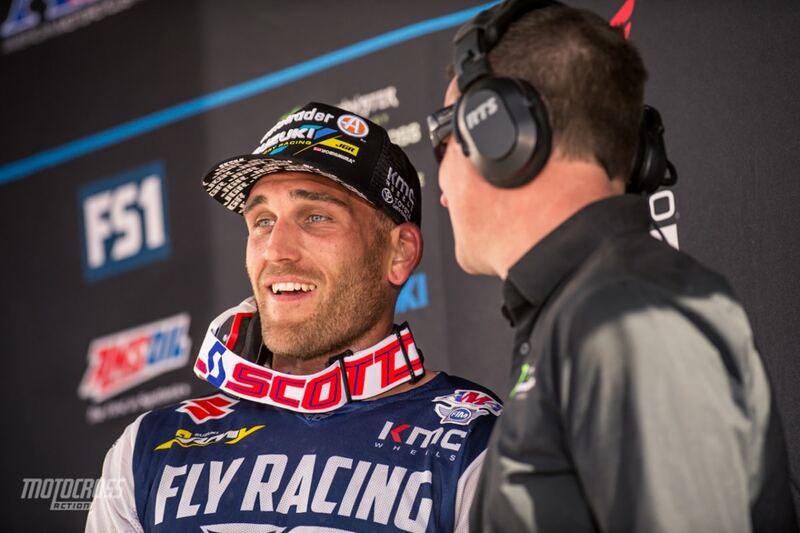 Some riders, like Chad Reed and Justin Hill have their own programs and they have their own people in their ears. As a rider, I don’t want too many people telling me things because it can get annoying at that point. I will definitely be around, and I will be hitting quite a few races. WESTON, ANY FINAL THOUGHTS? Just to circle back. I am doing a lot better. From where I was at when I got back to California from France until now, I have seen huge gains. I have been able to do a lot more since then. I have started to feel better, and everything is starting to click. I just want to keep moving forward.